It's the most wonderful time of the year... unless you're training for a marathon! Here are our top tips for sticking to your training plan over the Christmas break. Opt for a quick-dry base layer to wick the sweat away, then layer up with a fleece or running jacket. If it's really cold, add gloves and a hat too. But remember not to overdo it - once you get going your body will warm itself up! Although running on a treadmill isn't the same as running outdoors, it doesn't hurt to give yourself a break from the cold and head to the gym for your base runs. Try putting the incline up to 1 to mimic the resistance your legs normally feel running outdoors. We've put together a feel-good running playlist of true Christmas crackers to keep you in the festive spirit while training. Check it out here. Heading straight from relaxing in a warm house to pounding the pavement in the cold can be a bit of a shock to the system. You should warm up enough to get the blood flowing, but not so much so that you break a sweat before you've left. You could try running up and down the stairs or doing a few star jumps, alongside dynamic stretching to prep your muscles and joints. Whether it's a friend, a sibling or even the family dog, having company on a frosty training run will make it feel much less lonely. This is also a great way to test whether you've been sticking to the conversational pace rule! There's likely to be a Parkrun in your local area which you can join. 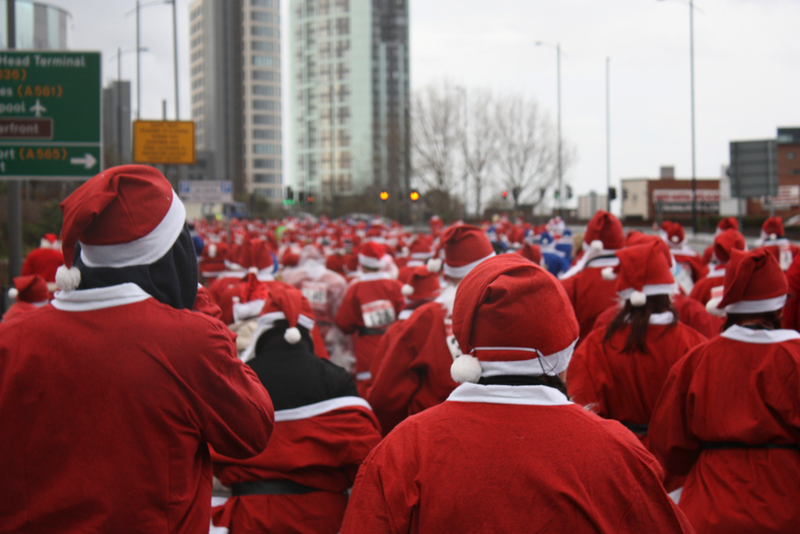 Or why not sign up for a Santa Dash? This could even double up as a fundraising opportunity. Just because it's cold, doesn't mean you aren't sweating! To avoid stitches and nasty cramps, you should always allow time for your body to digest your food before you run. For a large meal (600+ calories), you'll need to wait around 3 hours. This is a rule which always applies, but during the pig-out fest that is the Christmas break, with the average person consuming 6,000 calories on Christmas Day alone, it's a good idea to get the miles in before you sit down for dinner. Looking forward to dinner is also a great way to stay motivated on your run. Running in the cold is tough, and it's likely you will be a little slower. Don't beat yourself up about it - the important thing is getting those miles in. Block out days you can't train and enjoy your time off. After all - it is Christmas!